football players | Out of the Box! Football Fun Friday! The lighter side of 100 years of BearKat football. In our 100 years of football history the BearKats have shared their athletics facilities with professional and semi-professional teams. The most recognizable team that has used the SHSU athletics facilities would be The Houston Oilers. 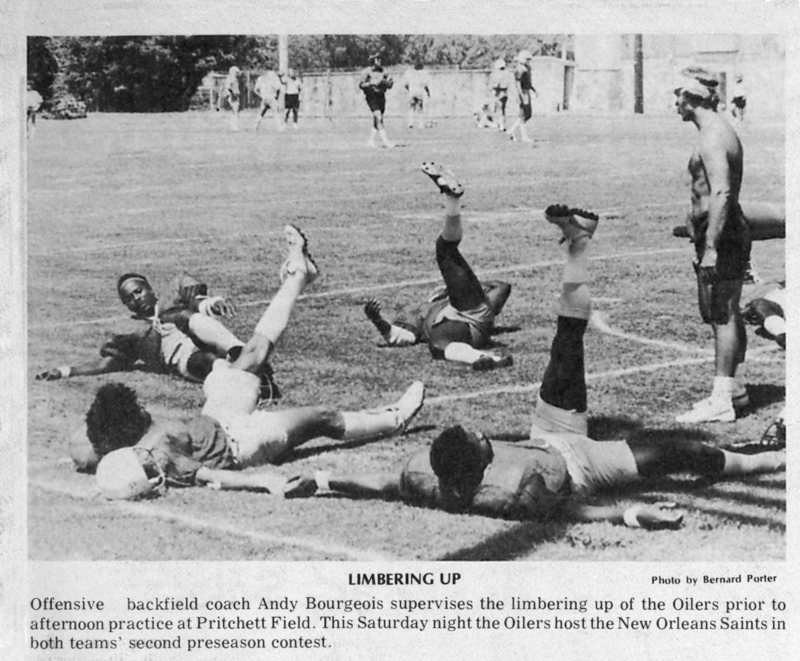 The Oilers held practice camp on the Sam Houston Campus every summer from 1974-1977. In 1978 the Oilers choose to move their summer camp to Stephen F. Austin University when Sam Houston State decided to start classes in mid-August. The Oilers showed up on campus in the summer of 1974 with a long list of requests for modifications to the SHSU athletic facilities that only professional football players would need such as bigger beds, specific dietary requirements like prime rib and ice cream every night, a Nautilus room and oversize towels. The photograph above is from The Houstonian, 8/6/1976. If anyone can identify these Oilers players university archives would love to hear from you. To learn more in-depth information about when the Oilers came to Sam Houston State University visit the University Archives in room 400 of the Newton Gresham Library. This blog showcases treasures of the SHSU Special Collections, Digital Collections, and University Archives at Sam Houston State University. We will provide a peek into the wonderful materials in our holdings as well as useful finding aids to collections from SHSU Special Collections and SHSU Archives.